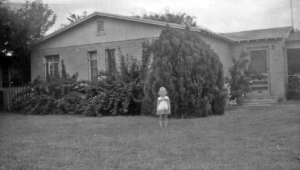 Joy stands in front of her family’s first home. Early in my faith journey, I checked off the box for “You shall not kill” (Ex. 20:13). Naively, I thought I would never have to worry about that commandment! I erased the checkmark when I came to understand that my words and actions to undermine someone else, including gossip, were a form of killing another’s spirit. I have similar thoughts about racism, something I once thought I could never perpetrate. Yet, I have benefited from racism and continue to do so. My ancestors came to the United States from Germany in the 1800s, attracted by land grants in Central Texas. “Land grant” is a phrase that legitimizes my ancestors’ claims on land stolen from Native Americans—in this case, the Comanche. I don’t live on those original homesteads, but I recently found an arrowhead less than a mile from my home of 27 years. The accidental discovery was my visual “hard reset.” I, like my ancestors, live on land once home to the Comanche—rarely acknowledging how we came to live here. Today, the majority of the Comanche Nation live in difficult circumstances in Oklahoma. I have childhood memories of undocumented men from Mexico working on my grandparents’ farm. They lived with their families in simple dwellings near the cow pen, at the back of the farm—a difficult life. I wonder whether those workers were paid fairly. The city of San Antonio eventually grew to include my grandparents’ land, increasing its value. Neither the Latinx families nor the Comanche shared in the modest inheritance I received from my grandparents’ farm. My father was the first in his family to attend university, courtesy of the GI Bill. My parents purchased our first home through a VA loan. The benefits of the GI Bill and VA loans mostly were denied to people of color. I continue to benefit from these programs that grew the wealth of the white American middle class at the expense of people of color who were denied these benefits. I once took it as a point of pride that my German ancestors refused to own slaves because they considered themselves to have been slaves in Germany. Racism, however, continues enslavement in other ways. I am complicit in this racism—an everyday white lens that upholds the white norm despite a multicultural world. And so, I sit in my discomfort, wrestling with my deeply-rooted complicity in racism, lamenting and repenting this sin. I want to end racism; yet, I have perpetrated and benefited from it. Walt Kelly’s phrase comes to mind: “We have met the enemy and [s]he is us.” If you are complicit in racism, I encourage you to sit in your discomfort along with me, joining me in prayers for guidance as to how we can end the sin of racism, the ugliest form of power. Joy Durrant is PW’s national vice moderator for justice and peace and is co-chair of the Racial Equity Committee. Lesson Five: In Community with the Tradition of the Past Scripture: Hebrews 3:1–6; 11 Tradition.